"Warning! Positively do not open!" Warner Bros has debuted the first trailer for horror sequel Annabelle Comes Home, the third movie in the Annabelle spin-off series which originally began in Jame Wan's The Conjuring horror universe. Gary Dauberman, the screenwriter of the Annabelle movies, It, and The Nun, makes his directorial debut on the film, which is produced by Peter Safran (Aquaman), who has produced all the films in the Conjuring, and Conjuring universe creator James Wan. Despite trying to lock her up, this time the creepy doll goes after the Warrens' ten-year-old daughter, Judy, and her friends. The cast includes McKenna Grace (who played the young Carol in Captain Marvel) as Judy, Madison Iseman as her babysitter, Katie Sarife, Emily Brobst, and Steve Coulter, with Patrick Wilson and Vera Farmiga reprising their roles as Ed and Lorraine Warren. I really like the use the color changing lamp in this trailer. 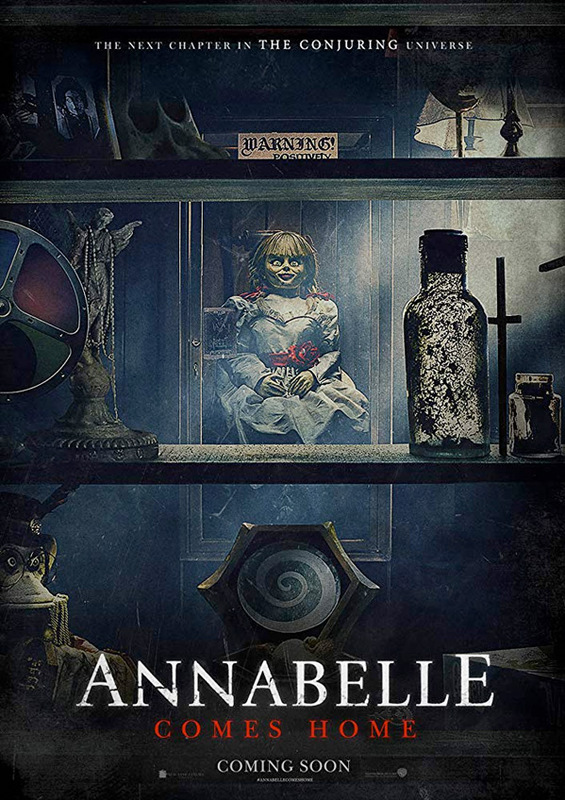 Determined to keep Annabelle from wreaking more havoc, demonologists Ed and Lorraine Warren bring the possessed doll to the locked artifacts room in their home, placing her "safely" behind sacred glass and enlisting a priest's holy blessing. But an unholy night of horror awaits as Annabelle awakens the evil spirits in the room, who all set their sights on a new target—the Warrens' ten-year-old daughter, Judy, and her friends. Annabelle Comes Home, or also Annabelle 3, is directed by American writer / filmmaker Gary Dauberman, making his feature directorial debut after writing screenplays for many major horror projects (Annabelle, Wolves at the Door, It: Chapter 1 & 2, The Nun). The script for this is also written by Gary Dauberman, from a story written by James Wan. Warner Bros opens Dauberman's Annabelle Comes Home in theaters everywhere starting June 28th in the summer. First impression? Who's scared already?